In August 2007, Mark Beaumont set off for a solo cycle around the world, aiming to set a new world record. 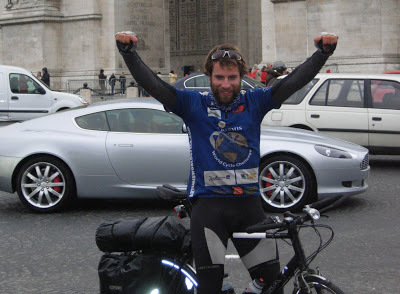 Between the 5th of August, and the 15th of February 2008, he had an amazing adventure, which I've blogged about elsewhere in detail, as he smashed the record and returned to the start point in Paris. Val Vannet, a great friend, and Mark's former geography teacher decided to follow the journey and blog about the route and the places that Mark passed through. She blogged the journey, and when she was unable to do it, I took over, following Mark through Australia, New Zealand and part of the USA, and then the final leg in France as he approached the finish line and Val went to meet him. Since then, Mark has worked following the baton relay around the world, and also did an incredible solo cycle from the north to south of Africa in just 41 days. Mark is now planning to cycle around the world in 80 days. Here is the planned route. You can follow the journey via live tracker from the website. This is a picture of Mark at the finish line in Paris. Mark is warming up by cycling around the UK in 14 days. Here's the route, and you can follow him on social media and in various other ways, including on Strava.